Bimini, The Bahamas – January 8, 2018 – Bimini Big Game Club Resort and Marina today announced that Wahoo Smackdown IX, or Wahoo Smackdown: Take Two, has been rescheduled for February 9-12, 2018. The tournament, which was originally slated to take place in November of last year, was rescheduled due to inclement weather. The tournament’s events will now kickoff off February 8th with a Captain’s Meeting and conclude on February 11th with an awards gala. Spots are still available for the new dates. 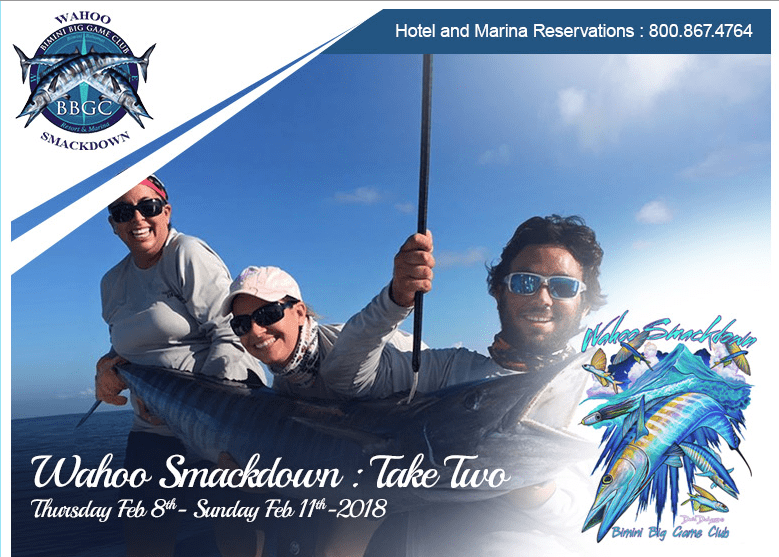 For more information, and to register, visit https://biggameclubbimini.com/wahoo-smackdown. Registration fee is $1,500 per boat and includes four anglers, tournament shirts and entry to social events. Additional anglers (over four) are $250 each. Extra social tickets are $150 each. Total payout is $25,000 based on 25 registered boats. Registration fee is 100% refundable if the tournament is canceled due to weather. A $300 instant credit will be issued for participants who book both hotel and boat slip for a minimum of a four consecutive nights. The $300 credit can be used in the restaurant or applied to the total resort bill. Sponsors for this year’s tournament include American Beverage Marketers www.masterofmixes.com as the Title Sponsor, Bahamian Brewery and Beverage (Sands) www.bahamianbrewery.com, Caza Offshore www.cazaoffshore.com, artist David Dunleavy www.dunleavyart.com, Live Wire Tackle https://livewiretackle.com and Tropic Ocean Airways www.flytropic.com.